Blizzard have announced the third expansion for Hearthstone, Whispers of the Old Gods, will be available to buy from April 27. Additionally, any pre-purchased card bundles can be opened from the same day. While you’re waiting, check out our list of the best Hearthstone decks. The expansion introduces 134 new cards, which will apparently “change your perception of the game… and the tavern… and possibly a lot of other things”. “For countless millennia, the Old Gods have slept. Now, the time of their awakening draws near; their evil influence has crawled even into the tavern,” says the official blurb. “Can you feel your cards trembling in their decks as the corruption spreads? Some of your old friends have already grown icky masses of tentacles and a downright frightening number of eyeballs! 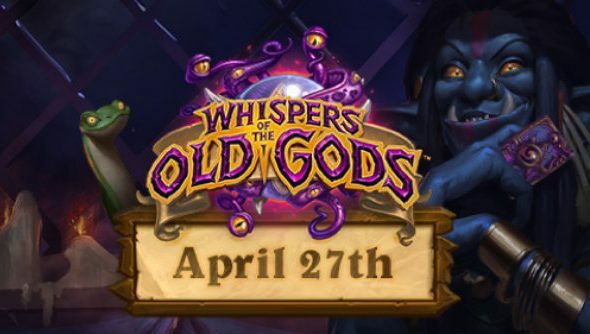 Once Whispers of the Old Gods goes live on April 27, the pre-purchase phase will end, obviously. So you have until then to pre-purchase a 50-pack bundle to secure a unique card back. If you want to see the expansion in action first, you can join lead designer Ben Brode and Hearthstone master caster Dan “Frodan” Chou on April 21 at 19:00 CEST for series of show matches against members of the Hearthstone design team. A number of new cards from the expansion will also be revealed during the stream. Give the Hearthstone Twitch channel a follow to get a notification when it’s beginning. We’ve compiled a massive list of all the Whispers of the Old Gods Hearthstone cardsrevealed so far, so check that out if you want an idea of what surprises await.